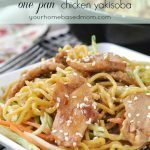 One Pan Chicken Yakisoba is the quickest and most delicious way to get dinner on the table fast! I don’t like doing dishes so I am a big fan of one pan dinners. I like to cook, I just don’t like the clean up. I always thought it would be great to just have someone follow behind me as I cook, cleaning up my messes!! This recipe for One Pan Chicken Yakisoba Noodles is the perfect solution for a delicious meal with little clean up. Yakisoba noodles are a kid friendly dinner and a favorite at our house. Using a prepared broccoli slaw mix and yakisoba noodles you can find in the produce department, make dinner comes together in minutes. All you have to do is run some warm water over the noodles to loosen them up. The chicken is cooked first with a yummy marinade of soy sauce, brown sugar, garlic, sesame oil and some seasonings. After the chicken is cooked through, add in the broccoli slaw and the noodles. Stir it all together until it is warmed through and the sauce is evenly distributed. Then dinner is ready! For another yummy one dish meal check out One Pan Baked Chicken Fajitas. 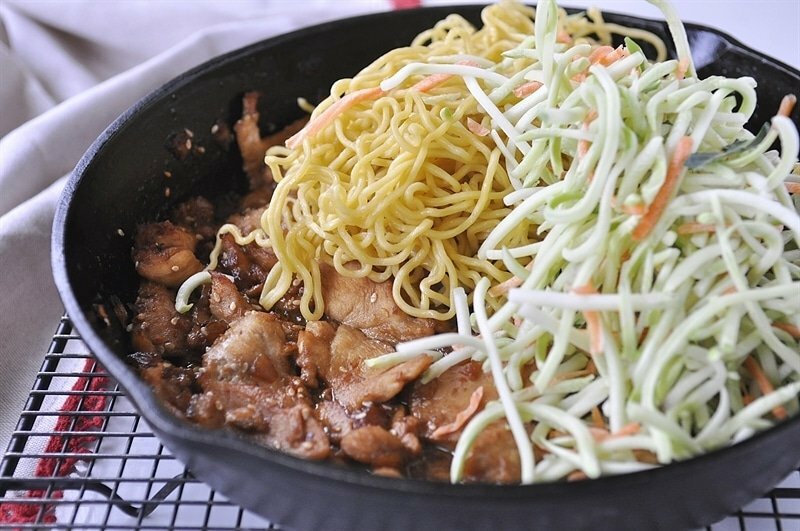 This recipe for One Pan Chicken Yakisoba Noodles is the perfect solution for a delicious meal with little clean up. Yakisoba noodles are a kid friendly dinner and a favorite at our house! Mix together onions, soy sauce, brown sugar, garlic, sesame oil, sesame seeds, red pepper flakes, salt and pepper in a bowl. Add olive oil into large skillet and heat over medium heat. Add in chicken and cook until chicken is cooked through. 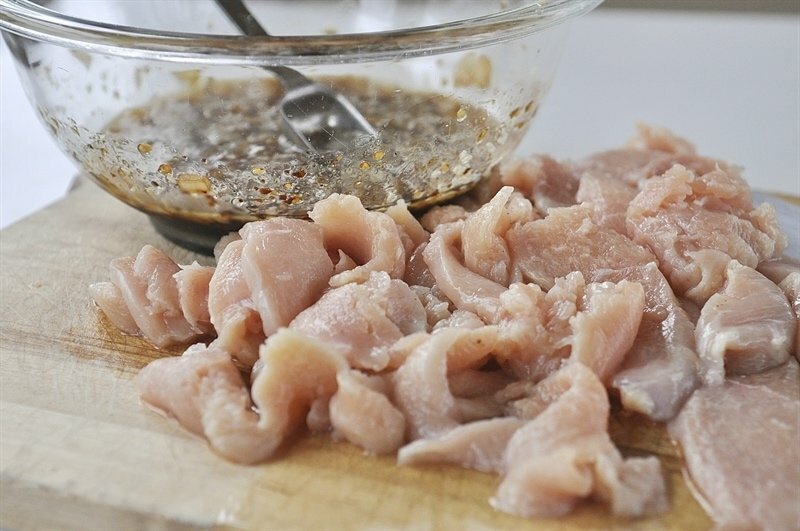 Add in marinade and stir to coat chicken. Add in noodles that have been run under water and separated or warmed in the microwave (I prefer microwave method). Add in broccoli slaw and stir to combine and until everything is combined. Hello, it looks like the recipe is missing the ingredients and some of the instructions. Or is it not showing up right for me?